"I have sculpted many similar character figures previously. 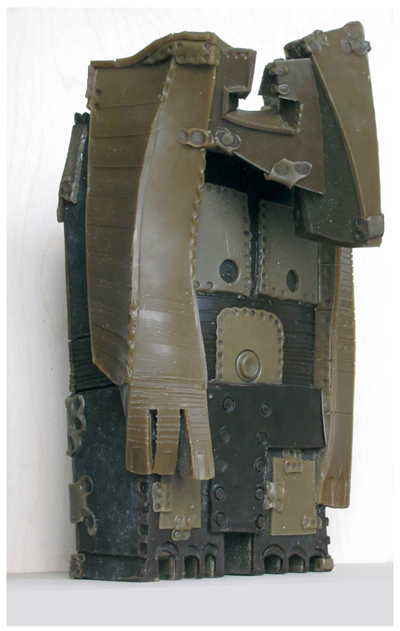 They are built up mainly in wax with putting layers of sheets onto and beside each other usually clinched and soldered with smaller straps forming an eventful dynamic construction, then the works are cast into concrete or bronze. This complexity of forms fitted well the aim to create a soldier but instead of wax, I chose to build up a steel figure with direct forming and welding. Whilst studying the Terracotta Army I found a senior soldier that lifts up his right hand pointing finger as if he wanted to warn us about something. Regarding that all other soldier (I had seen from Xi'an) never tried to start a visual communication like this, I gave a bigger importance to this motion and used it. The nice long nosed old chap, that is tired of fighting; the retired veteran that I created, instead of animating us on anything, decides to warn us with unspoken feelings of a wise man. The conclusions depend on us."